I did not see a thread for Sheri-Lynn, so I thought I would start one. On October 7, 2013, Sheri-Lynn McEwan, a 40 year old nurse at Health Sciences North, was found severely injured at her home on Elbow Ridge Road off Nelson Road in Estaire, a community just south of Sudbury. She later died of her injuries. The day of her murder, Sheri-Lynn had just returned home, having been driven back from Toronto by friends after a weekend in Las Vegas. Her friends said nothing looked out of the ordinary when they dropped Sheri-Lynn off, however, shortly afterwards at 4:02PM a 911 call was made from her home. Police have been unable to comment on who made the call, nor did they confirm reports that there was no sound on the line. Police have also been unable to say whether this murder was an isolated or random attack. Forensic evidence has been collected, but again, police can't release any information on that subject. On October 27, 2013, Sheri-Lynn's husband, Terry Boyle, took his own life. Terry was Deputy-Chief at the Estaire Fire Department. This is an unusual case, especially considering the suicide of her husband. A DI with the OPP, Shawn Glassford, is now investigating this case, looking for tips and information from the public. While it might be tempting to assume that 'the husband did it', the impression I get is that this may not be the case. Anyone with any information about McEwan's murder should call the OPP at 1-888-310-1122, Sudbury OPP at 1-705-564-6900, or Crimestoppers at 1-800-222-TIPS (8477). As for the anniversary of her death, McEwan is being honoured today at Health Sciences North, where she worked as a nurse. Operating room staff members will host a potluck, and a plaque will be erected in her memory. http://www.northernlife.ca/news/editorial/21-murder-throne-sudbury.aspxinitially offered vague warnings that the culprit, potentially armed and dangerous, was still at large. As days pass with no arrest and no new information, some, naturally, feel their concern turning to fear. Unfortunately, these articles are not in chrono order. I will highlight the dates. And thank you Wantedwanted for adding her name, the links, etc, and setting up her thread. "What I'd love to emphasize is that ... somebody out there knows about this case," she said. "There is someone who knows what happened. And they have that little bit of information that may help us solve the case because this crime deserves to be solved." Sirois noted that, like all Crime Stoppers rewards, this one is only available until next Thursday at midnight. She added a different reward may be put in place after that. Crime Stoppers accepts anonymous tips by phone, text or online. Would Sherri and Sonia have worked together at any time?? How far was Sherri's home from where Sonia lived? But basically, were they acquainted in any way or would know someone that worked in the area they did. That could be a lead right there, if they were friends with anyone that knew them both. Did they ever work in the same hospital together or go to nursing school together? Just to add to that, I notice they are around the same age. Here is Terry's obit. No mention of other family members, and no service. Quite an interesting story, a red headed nurse about the same age as Sonia Varaschin murdered. An apparent 911 call then silence.. Almost as if accidental unplanned or from someone with remorse..
Sheri-Lynn had a new man in her life for about the last three years prior her murder.. She had just arrived back home from a Vegas vacation without him.. Then murdered almost immediately after being dropped off. No reports of robbery interrupted.. Her partner a Mr. Boyle was considerably older than Sheri, twice divorced previously and new to town where he met Sheri. Friends and associates all say Mr. Boyle was a great guy and no one believes he could have murdered Sheri. They could be right however we have heard all this sort of thing before in numerous other spousal murders. The latest being the person arrested in the Jessica Newman murder. His friends and supporters still saying he didn't do it and will be cleared at trial. So Mr. Boyle commits suicide a few weeks after Sheri was murdered.. That never looks good but friends say he died of a broken heart. It may be but we see that the same murder investigator from Sonia Varaschin's investigation is involved in this now too. No disrespect intended, it may be just as his friends claim but there is a murdered woman who's killer has not been found. Just happens to be a red headed nurse.. Maybe the killer moved from Sonia's area to Sheri's area? Maybe this is his type? Shelley Loder was apparently quite similar in appearance to Sonia Varashin as well.. Is this why the same investigator is involved here too? Furthering an investigators interest I'm sure is that the description of Mr. Boyle fits the composite of a poi released in Shelly Loder's attack. Boyle had red hair like the poi in the Loder composite. Zoom in and compare the features of the composite with Boyle.. Is this what attracted Sonia's investigator to look at Sheri's murder? Boyle- zoom in on the second picture in the first post..
Not too clear on how and why such a nice guy would be estranged from two ex wives and children. Nice guys usually manage to work things out amaicably...just saying. 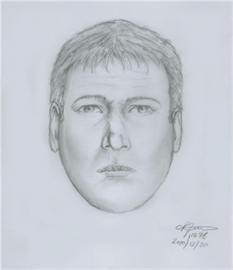 I tend to see a likeness in the composite drawing. Nice guys are not always nice home. We could see someone that was a Prince when they are on the outside, but a jealous and controlling person in his own home. Just as there are violent people that look so peaceful and them when you get the alone, they turn into a different kind of person. There are people like that, they are sweet as honey and then in a flash they can turn angry and you think you are dealing with a different human being. I know people like that, not to murder anyone, but it sure startles you and you just feel unsafe. I never encountered anyone in any relationships I had, but they are out there. Nobody answered my quesetions in relation to Would Sonia and Sheri have known each other in any way, either going to school of nursing together or ever worked together? And how far away is Seri-Lynn's residence in relation to Sonia's. I am not from Ontario, so have no idea where these places are in relation to one another. Maybe the police could do some kind of an investigation to see if they had a mutual acquaintance over the years. They are both around the same age, as I stated before. So they could easily have went to nursing school together. Okay, just wondering on those points. I find it exceptionally strange that his family was not involved - at least, a comment in his obit. The fire department did say that he was estranged from his family, but what about his parents, if living, his brother or perhaps a sister, and perhaps he had children. Nothing - just total silence. I mean how estranged can a person be? I get the feeling that his wonderful firefighter friends set up the final arrangements for Terry, pitched in and paid for it. The small village has 500 people, why the rumours, and what are they? I realize that even firefighters can lose their home with fires, however that is very rare. They know all about fire prevention, checking electrical outlets, etc, etc., you name it. Their home burnt down in 2011. And a new home was built. Seems to me Terry ran into a lot of tragedy in the last three years of his life. Hard to know what the rumors are. So you're saying he was in a couple of relationships before marrying Sheri-Lynn. It kind of points to him as her killer. So he was estranged from Sheri-Lynn also. But if she was afraid of him, she should never have came home from a trip and then just went into her own home without someone being with her. I does sound to me like he was the killer. Don't know what evidence is there, but they were separated and that would be a very jealous motive, she was away having a good time and that would have tipped the scales to violence. The fact that everything was very quiet on this case, shows the police believe he was the killer. Capeheart, here's a map of distance between Sudbury and O'ville. A little over 4 hours driving. As far as Sonia and Sheri-Lynn studying together ... I wonder. Sonia has a few years on Sheri but I don't think Sonia went into Nursing right after graduation. Didn't she take some time in deciding what she was going to do? As far as Sheri going to Vegas without Terry, I think it was a girl trip with her friends. Nothing is stated whether he resented that, but he could have been stewing over it for the whole week while she was away. Very odd that Terry's life before the 3 years he was in Sudbury is almost non-existent on the Net. He owned some property at Manitoulin Island. Didn't residents find that suspicious when he arrives and seems to have no family, friends, etc from his past?